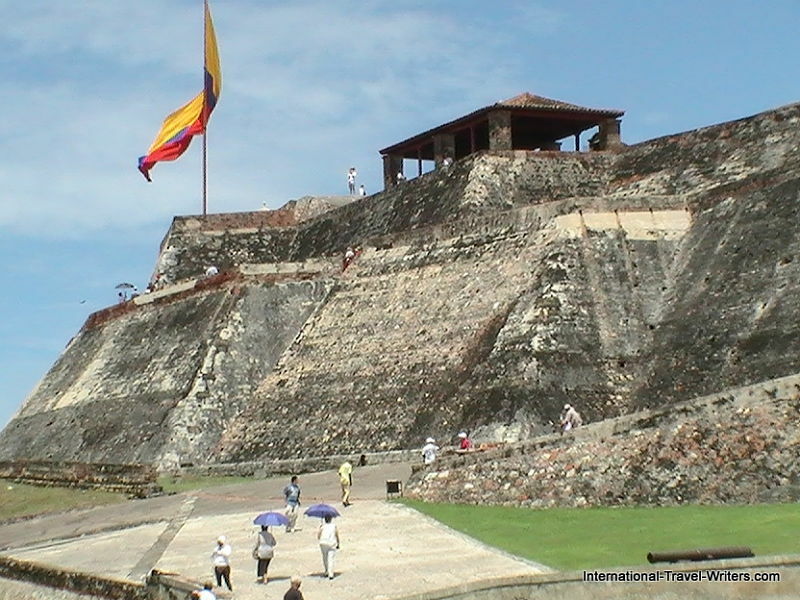 Deluxe Cartagena & Fortress…Board an air-conditioned bus to the city of Cartagena. 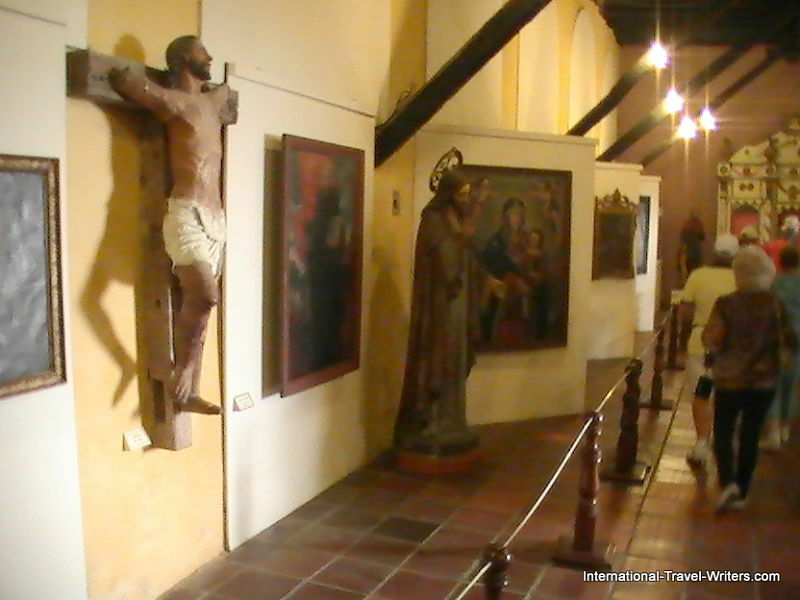 Pass the Republican architecture of the Manga residential area with a stop at the Fort of San Felipe de Barajas, Las Bovedas (The Dungeons), the Inquisition Palace, San Pedro Claver Church and the Navy Museum to enjoy a folkloric show. 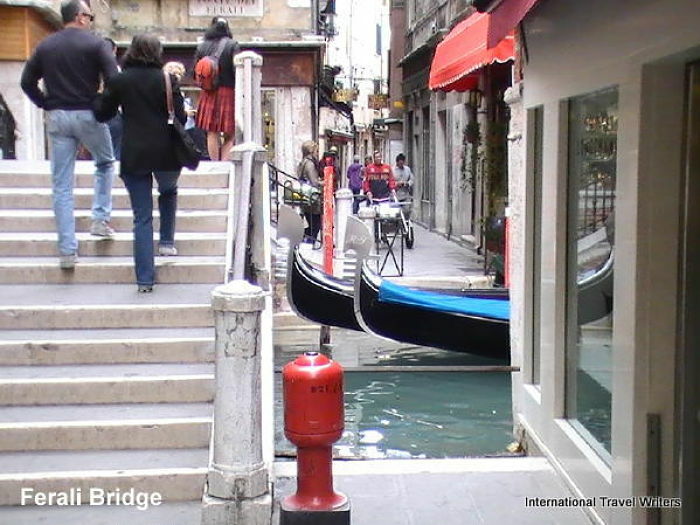 The tour will end with 45 minutes shopping for handicrafts. 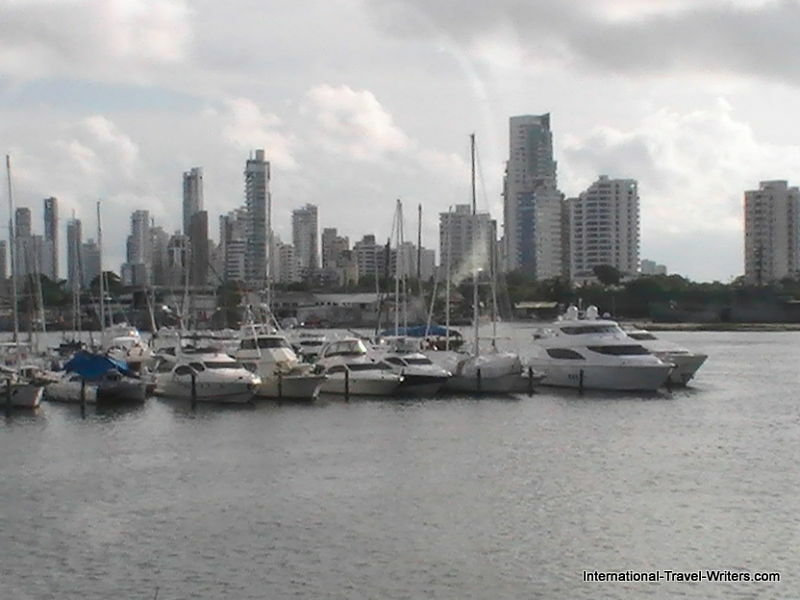 Cartagena by Land and Sea…Relive the land and sea battles between the Spanish Colonials and many infamous captains and pirates raiding the Spanish Main. Enjoy a pleasant bay cruise and a land fortress tour with a local interpretive guide who will bring to life this era by providing the amazing history. 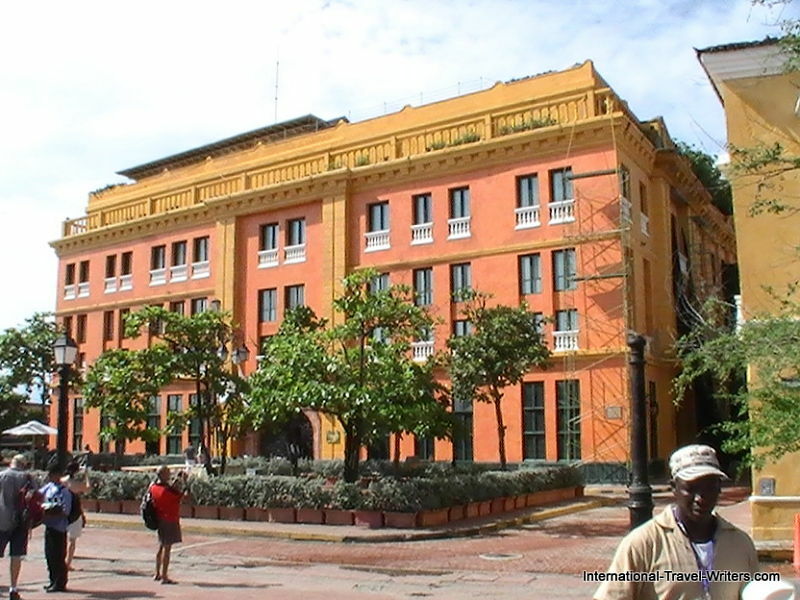 Panoramic Cartagena by Horse Drawn Carriage…Venture through the narrow streets of the famous walled city in a horse-drawn carriage. We were taking the tour that is last on the list above. 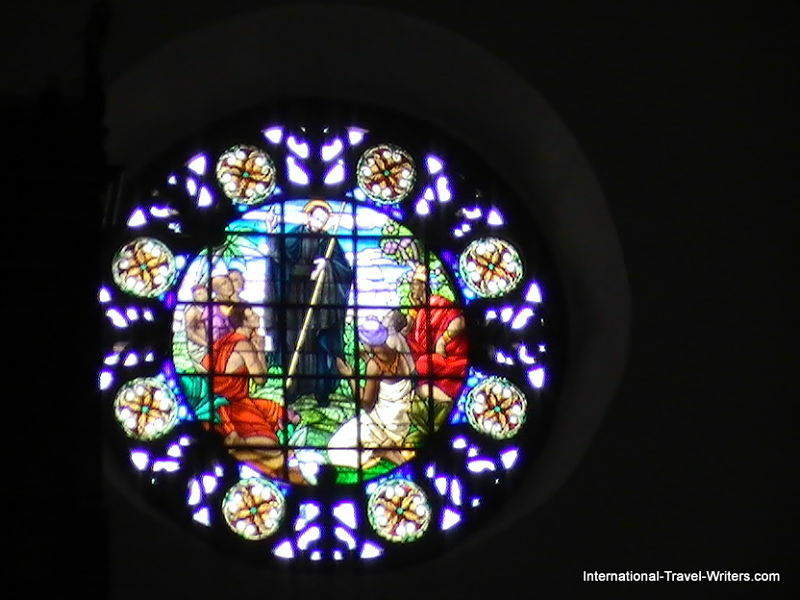 The first stop was the amazing Fort of San Felipe de Barajas. 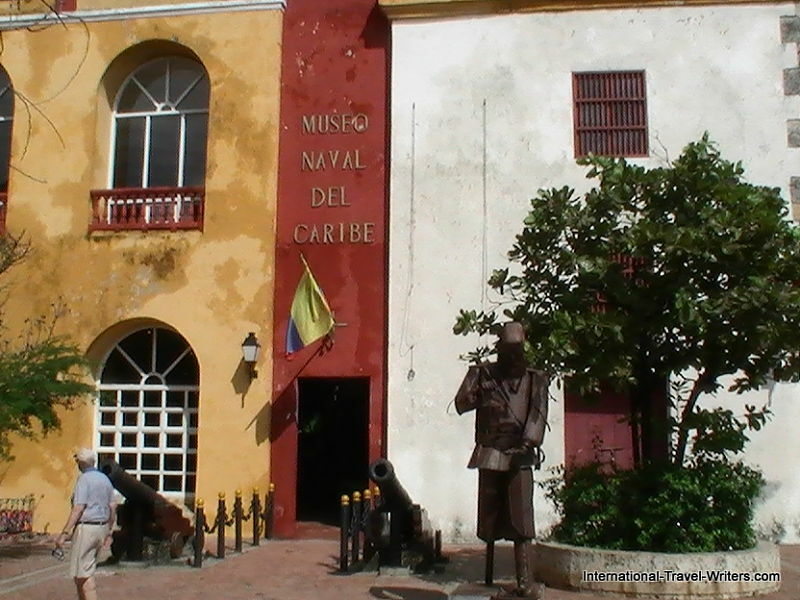 It was built by the Spanish for protection against the pirates who were haunting the area seeking to intercept some of the gold being shipped to Europe. Flurries of attempts to storm the fort were mounted…but it was never penetrated. The ingenious design of the fort was planned so that if one part of the fortress fell to invaders then the defenders could fire from another part. It was also connected underground by a maze of tunnels that did double duty; one was to hear the footsteps of any enemies that were lurking and the other was to distribute provisions or provide an exit strategy. 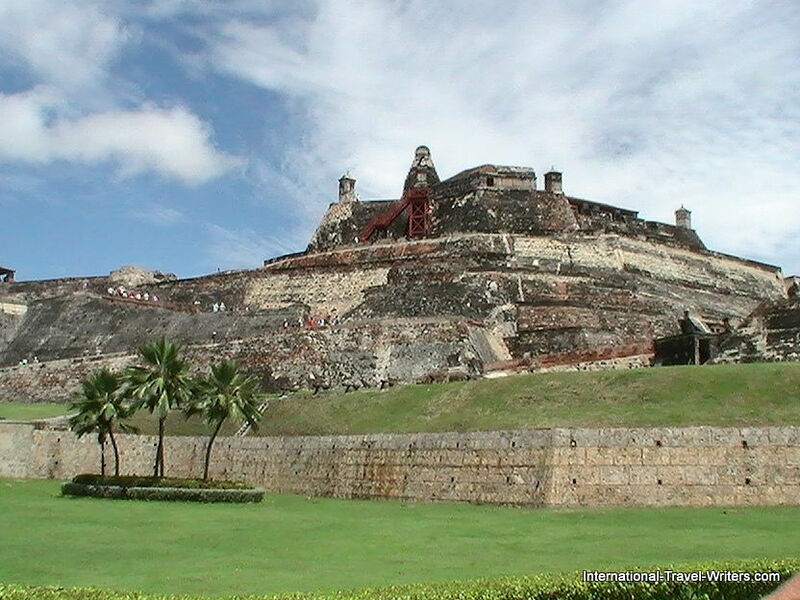 The Castillo San Felipe de Barajas, the fortress in Cartagena, Colombia, mentioned above was named in honor of Philip IV of Spain. 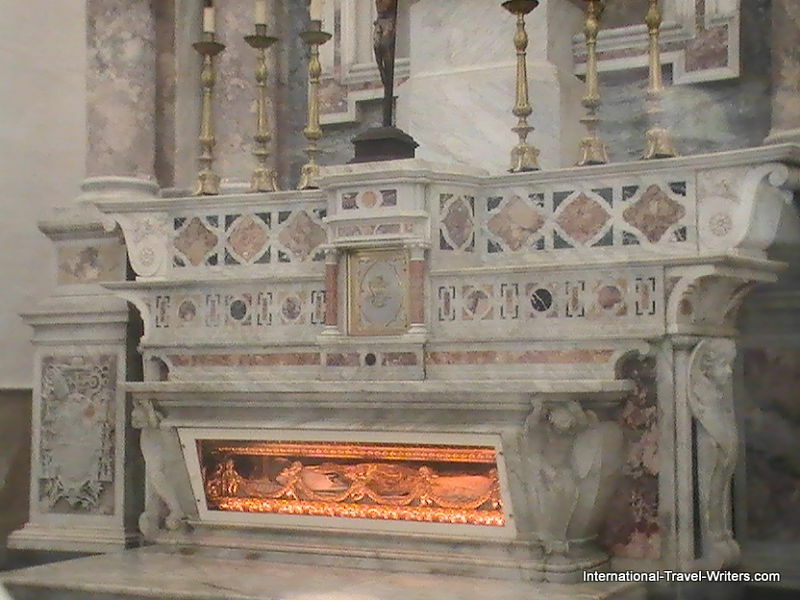 It dates back to 1536 when the Spanish first started building it. 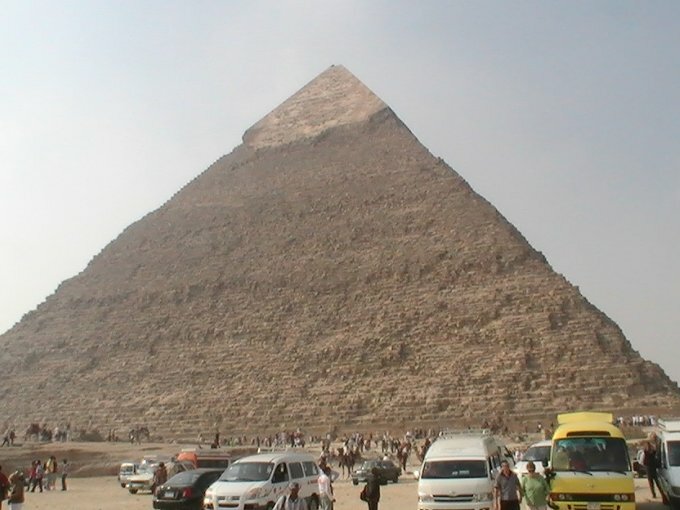 Although significant expansion was done in 1657, and another expansion done in 1763, it retains the original triangle shape on the top of Hill of San Lazaro. The castle is weathered but well preserved. When it stopped being used for military purposes it became overgrown with tropical vegetation which also crawled into the trenches and tunnels. 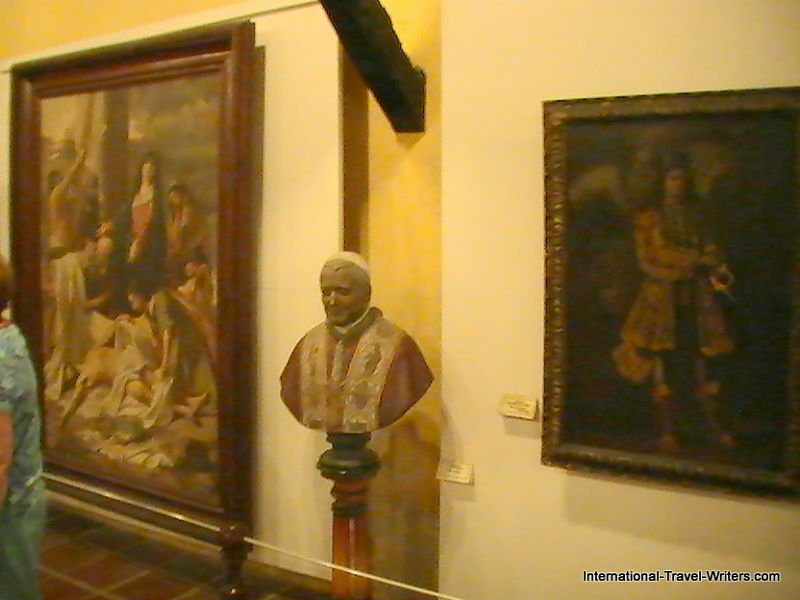 However, a restoration effort was successful and it’s a magnificent example of the Spanish colonial era. 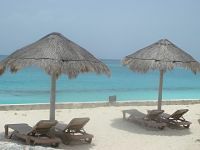 It was named a UNESCO World Heritage Site in 1984. 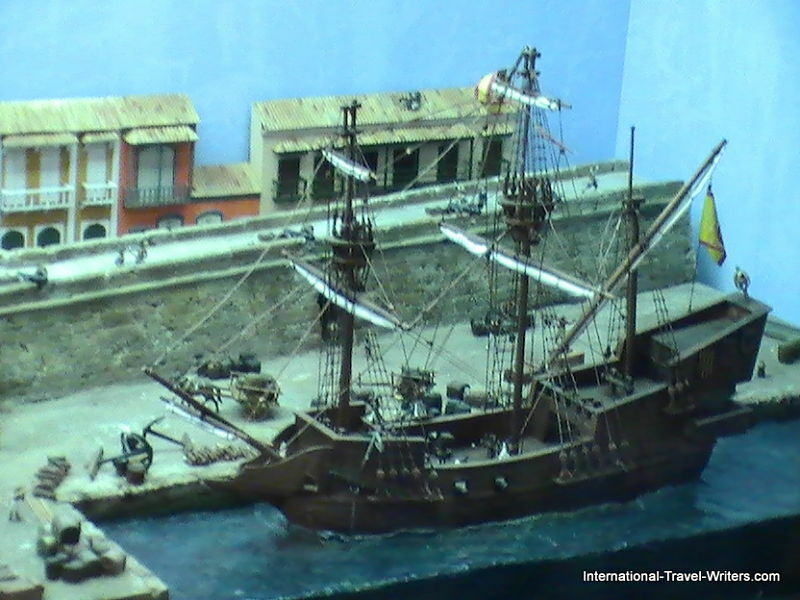 Seen below is a display that was inside the fort showing a replica of a pirate ship in their harbor. 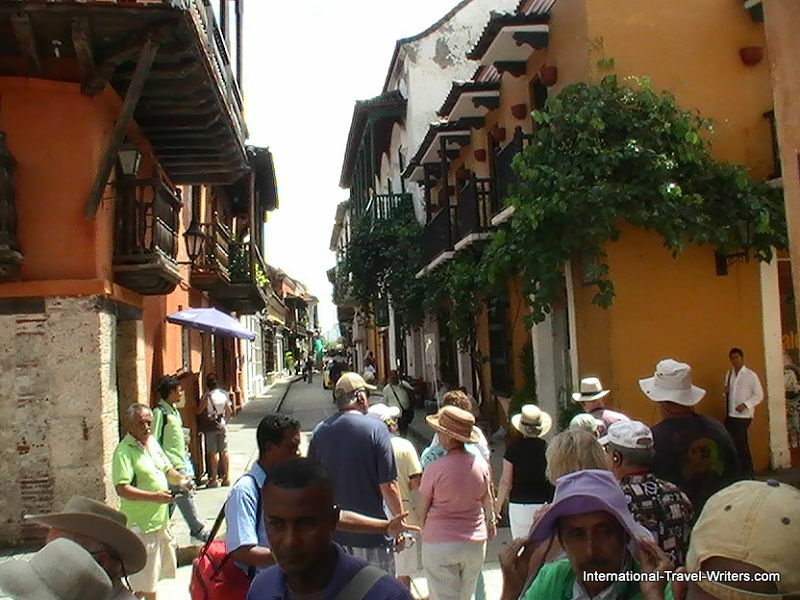 After leaving the fort we were taken to the “Old Town” area for a walking tour to the Inquisition Palace. 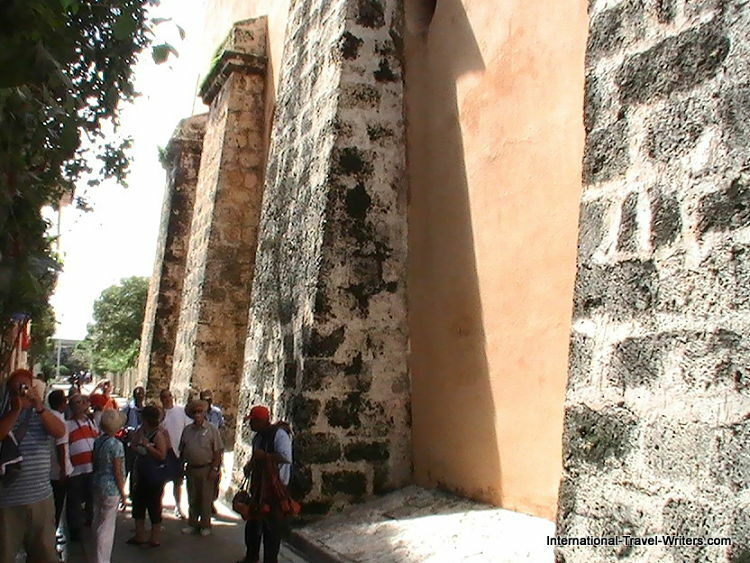 The first thing we saw was the high stone walls because this old colonial section was a fully walled city. The entry by the Puerta del Reloj is the main entrance of the walled enclosure which gives access to the Plaza de los Coches (Square of the Carriages). Long ago this is where the slave market was held. 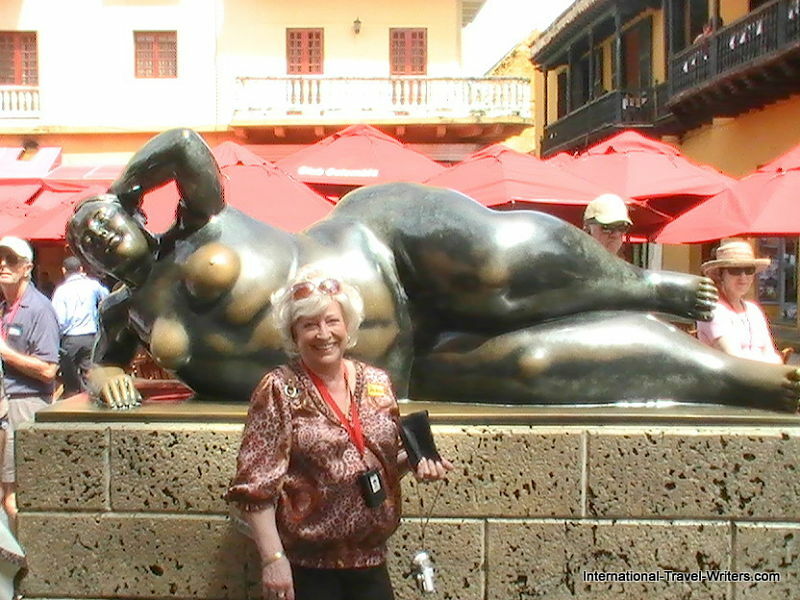 The next thing we encountered was an amazing bronze statue by Botero that was in Plaza Santo Domingo. Fernando Botero is a Colombian artist who is famous for his works of full figured men, women and animals, both in paintings and sculptures. 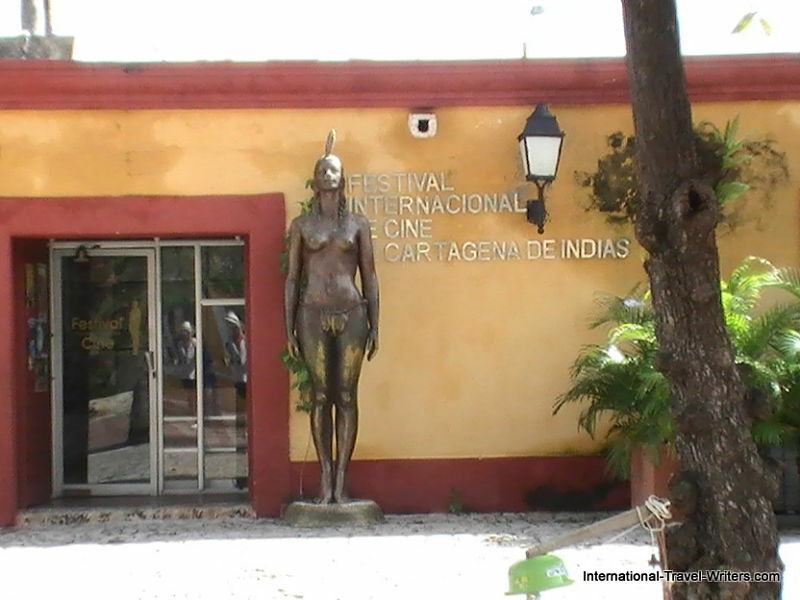 Botero gave this sculpture as a gift to the city. It’s called “Mujer Reclinada” (Reclining Woman). 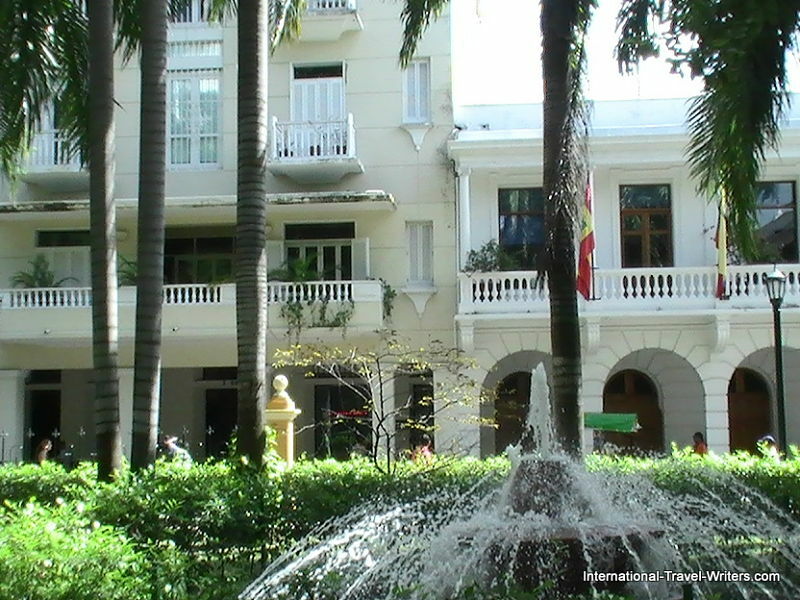 Located in the same area,is the Tcherassi Hotel, a renovated 250 year old colonial mansion. 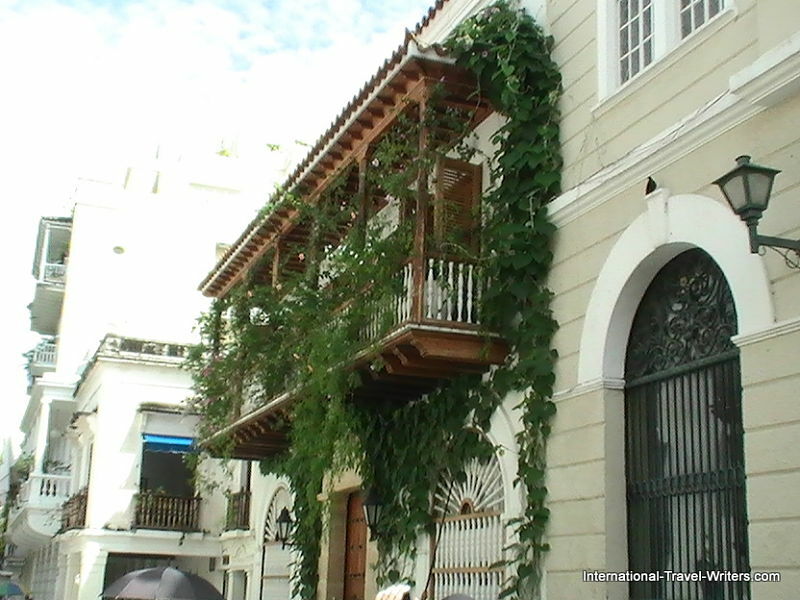 Although the architecture is varied in the city, it is mainly a colonial style. Saint Theresa Cloister is another remodeled building which is now the Charleston Hotel. 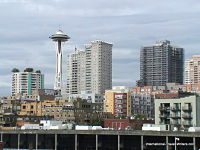 It has its own square, protected by the San Francisco Bastion. Seen both above and below are scenes of the narrow old town streets and an example of the adorned balconies that we saw. Upon entering the Inquisition Palace, the first thing you see are the historical facts of the location posted on the walls. 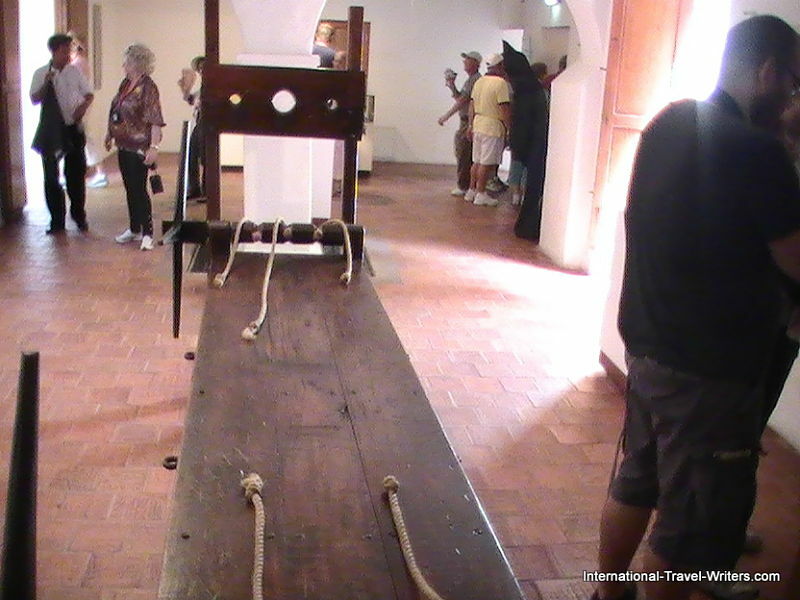 This is where the Court of the Holy Office (Spanish Inquisition) carried out its functions, torturing, judging and punishing those accused of crimes against religion. 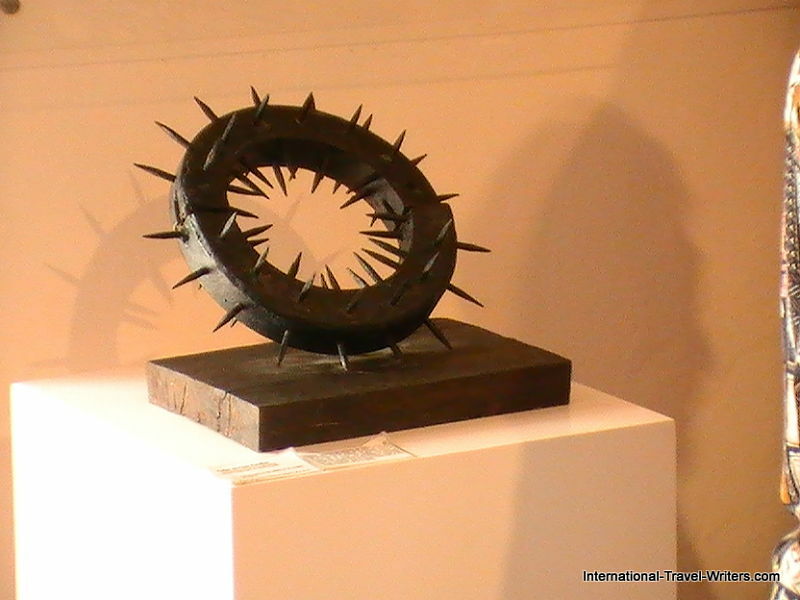 There is a collection of rusted instruments of torture housed there. The era of the Inquisition isn’t a good time to have lived here. 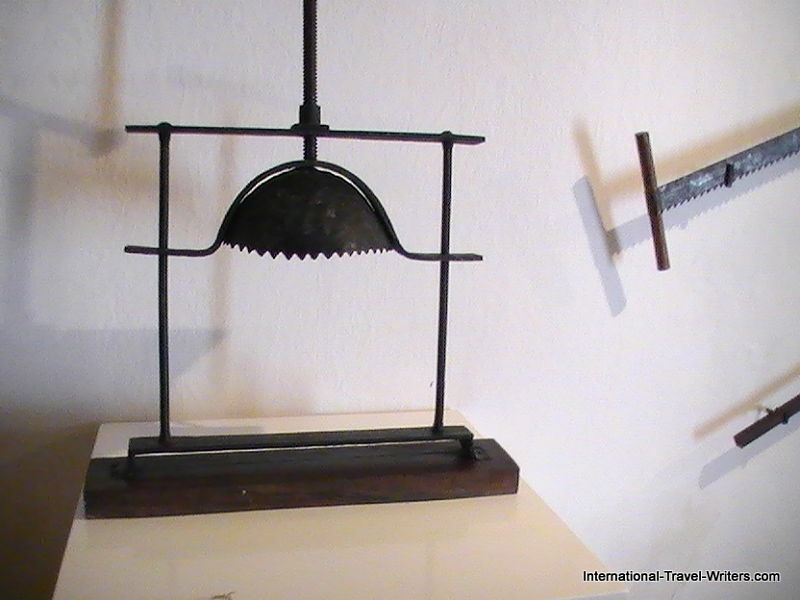 Seen both above and below are examples of the rusted and grizzly torture mechanisms. 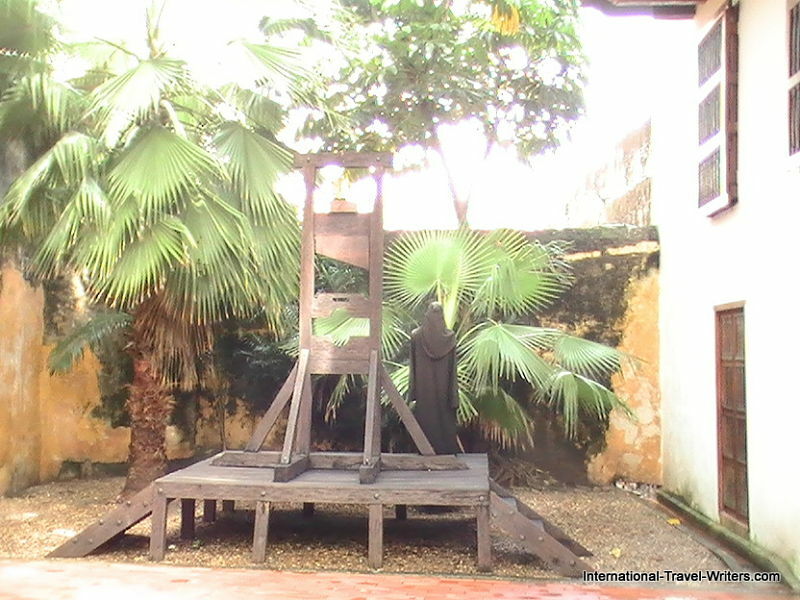 A rather primitive example of the old guillotine is still exhibited. 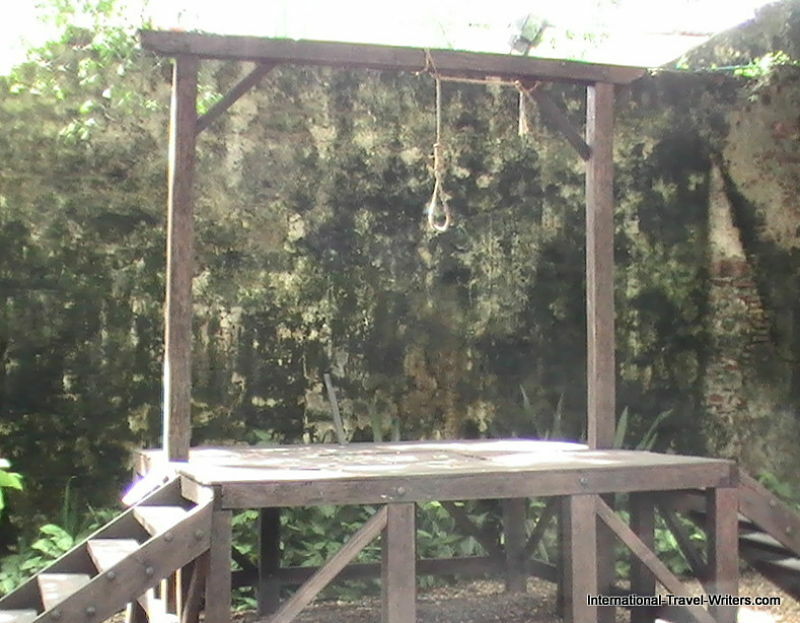 Also, the gallows seen below looked like those used in the Old West in the USA. Bolivar Plaza is essentially a small park where there are benches to sit and rest for a few minutes before walking further. 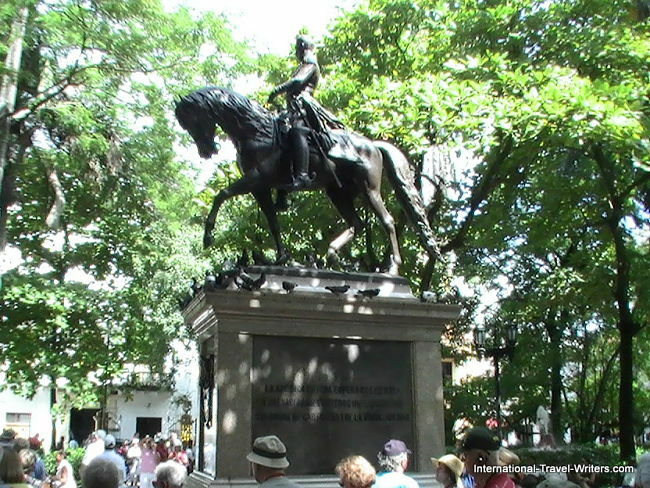 There is monument to Simon Bolivar located centrally in the plaza. 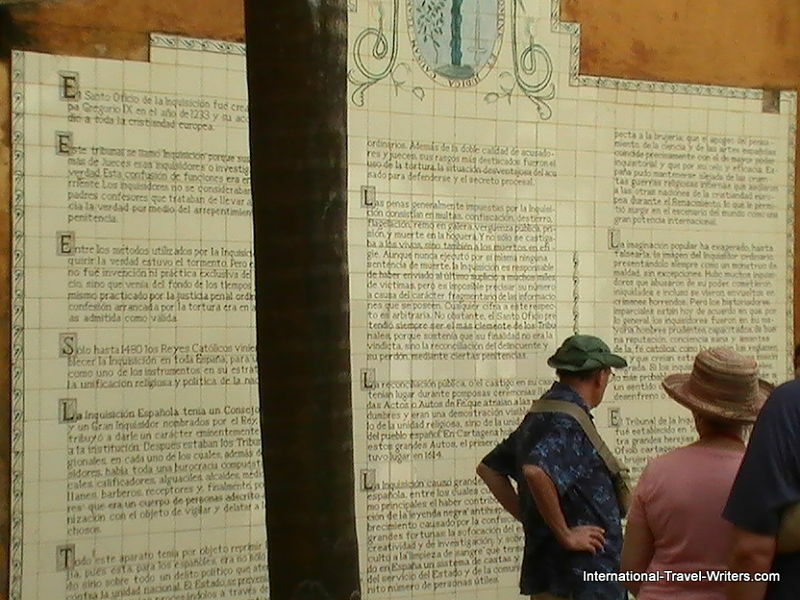 This was formerly known as Plaza de Inquisicion because of its close proximity to the Inquisition Palace. Outdoor cafes line the street with trees providing protection from the sun. 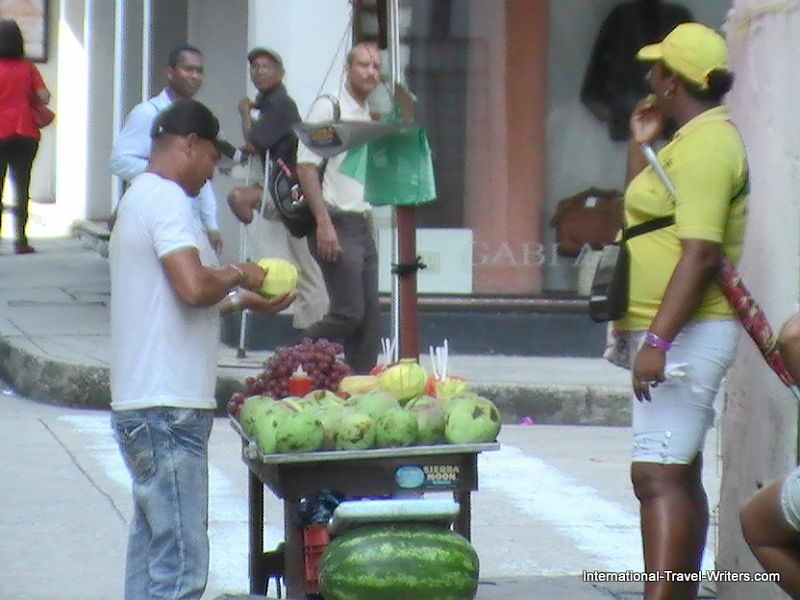 Fruit vendors were on almost every corner. Instead of soft drinks, the juicy fruit does the trick. 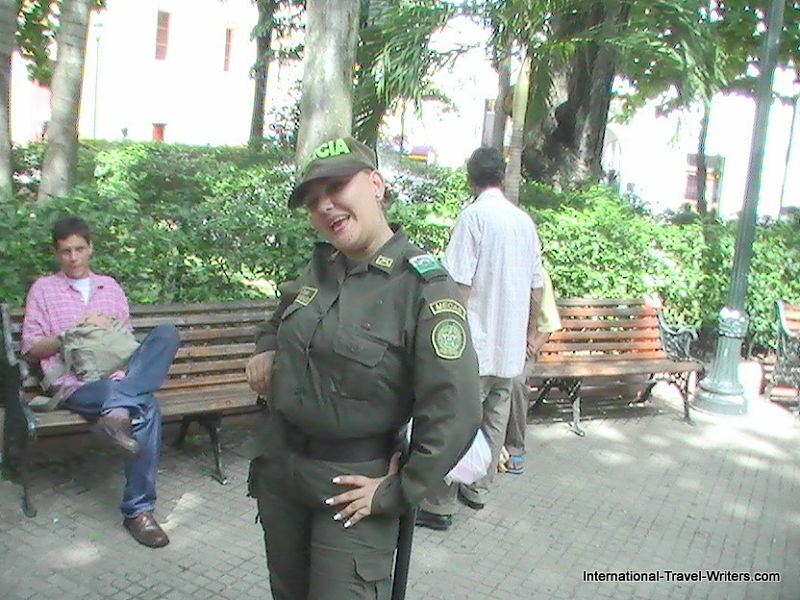 Seen above is one of the policewomen patrolling the area. She was able to speak English and was quite friendly. 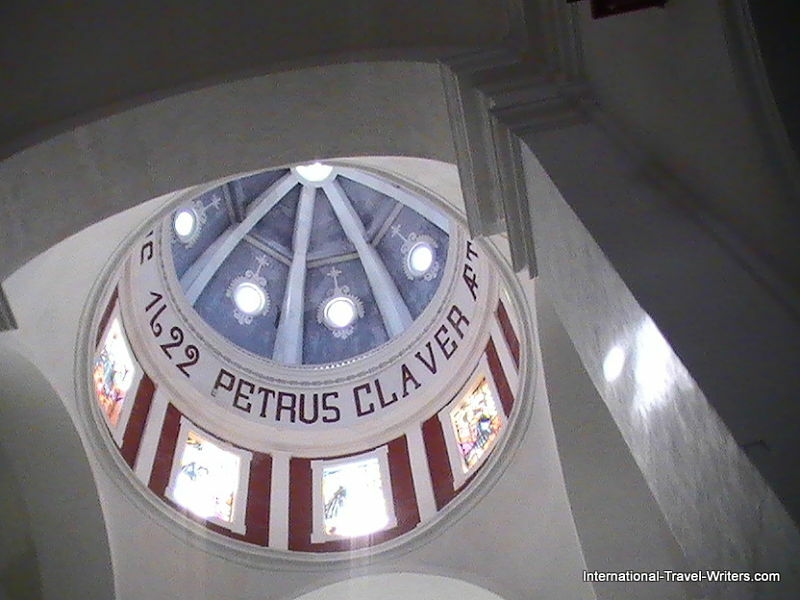 Above are photos of the Dome of San Pedro Claver Church, the monastery of San Pedro Claver, an example of the exquisite stained glass, and lastly, the high altar where the remains of San Pedro Claver are encased. Between the monastery and church there were lush, tropical gardens with resident parrots that were quite tame. They snooped around the tourists which included us. 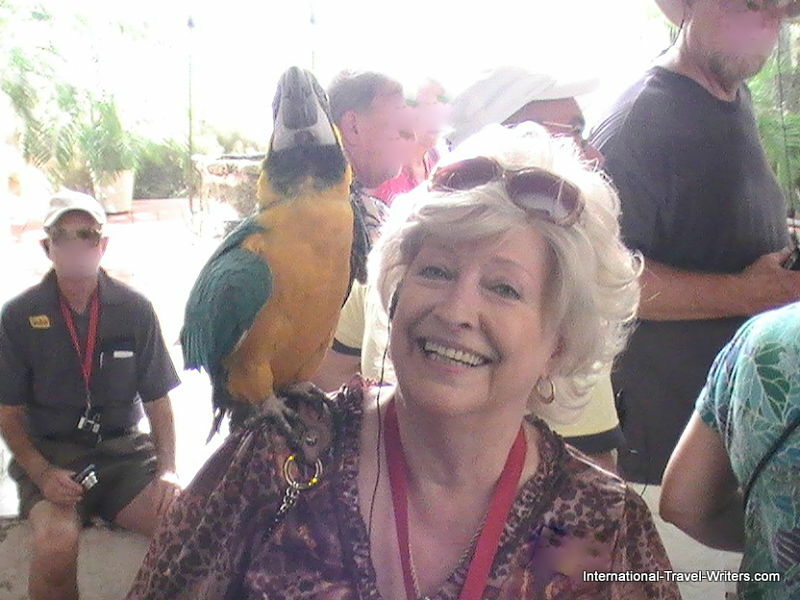 One of the parrots hopped on my shoulder and he was muttering something. It was hilarious. After the visit to the Naval Museum and wandering looking at sculptures and statues, we were taken to Pierino Gallo Mall where there were jewelry stores with gorgeous emeralds. It was really tempting but I'd done my major purchases in Acapulco. Next time, maybe. The day was ending and we had to board our bus to go back to the ship. 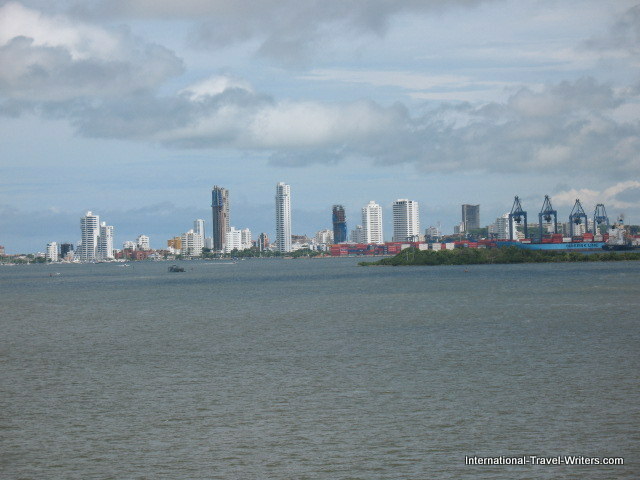 We would be heading for Fort Lauderdale, the last leg of the cruising to Panama journey.